It’s a grand ole flag! During the American Revolution, Betsy Ross was commissioned to create a flag to fly in honor of the new colonies in America. A field of blue set the background for 13 white stars which represented each of the newly formed colonies. This flag the subsequent versions since 18th century are undoubtedly the most enduring and recognizable symbol of the United States of America. 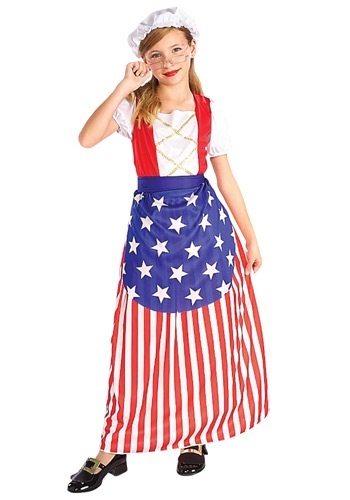 Show of your patriotic style with pride in a Betsy Ross costume. Go for a traditional colonial look with a simple black and white cotton dress, apron and “mop cap” bonnet perched atop your locks. White stockings, colonial type shoes and a pair of spectacles (to see all that tiny stitch work) will give your Betsy Ross costume an authentic look. More stylized, red-white-and-blue Betsy Ross costumes are available for girls and women for a fun, parade-type look. Bring along an American flag in a large embroidery hoop and there will be no mistaking your support for the cause.